Parents of infants born with clubfeet may be reassured that their baby, if otherwise normal, when treated by expert hands will have normal looking feet with normal function for all practical purposes. The well treated clubfoot is no handicap and is fully compatible with normal, active life. – Ignacio Ponseti, M.D. The majority of clubfeet can be corrected in infancy in about six to eight weeks with the proper gentle manipulations and plaster casts. The treatment is based on a sound understanding of the functional anatomy of the foot and of the biological response of muscles, ligaments and bone to corrective position changes gradually obtained by manipulation and casting. Less than 5% of infants born with clubfeet may have very severe, short, plump feet with stiff ligaments, unyielding to stretching with a deep transverse skin fold across the sole of the foot and another crease above the heel. These babies require special treatment and may need surgical correction. The results are better if bone and joint surgery can be avoided altogether. Surgery in the clubfoot is invariably followed by scarring, stiffness and muscle weakness which becomes more severe and disabling after adolescence. The treatment should begin in the first week or two of life in order to take advantage of the favorable elasticity of the tissues forming the ligaments joint capsules and tendons. With the ponseti method these structures are stretched with weekly, gentle manipulations. A plaster cast is applied after each weekly session to retain the degree of correction obtained and to soften the ligaments. Thereby, the displaced bones are gradually brought into the correct alignment. Five to seven plaster casts extending from the toes to the upper thigh with the knees at right angle should be sufficient to correct the clubfoot deformity. Even the very stiff feet require no more than 8 or 9 plaster casts to obtain maximum correction. Before applying the last plaster cast which is to be worn for three weeks, the Achilles tendon is often cut in an office procedure to complete the correction of the foot. By the time the cast is removed the tendon has regenerated to a proper length. After two months of treatment the foot should appear overcorrected. Recently we found that the treatment can be shortened by changing the plaster casts every five days. Following correction the clubfoot deformity tends to relapse. To prevent relapses, when the last plaster cast is removed a splint must be worn full-time for two to three months and thereafter at night for 3-4 years. The splint consists of a bar (the length of which is the distance between the baby’s shoulders) with high top open-toed shoes attached at the ends of the bar in about 70 degrees of external rotation. A strip of plastizote must be glued inside the counter of the shoe above the baby’s heel to prevent the shoes from slipping off. The baby may feel uncomfortable at first when trying to alternatively kick the legs. However, the baby soon learns to kick both legs simultaneously and feels comfortable. 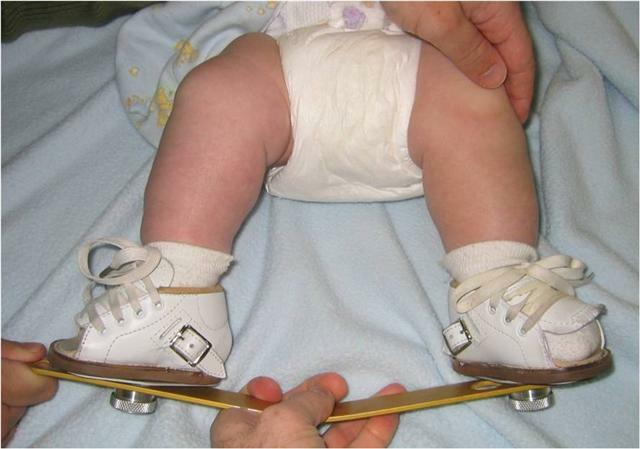 In children with only one clubfoot, the shoe for the normal foot is fixed on the bar in 40 degrees of external rotation. During the daytime the children wear regular shoes. Shoes attached to the bar often cause pressure blisters and sores. To prevent such distressing problems, we have devised a new foot and ankle abduction orthosis that holds the foot firmly and comfortably in place, causing no sores. Since the surgeon can feel with his fingers the position of the bones and the degree of correction, X-rays of the feet are not necessary except in complex cases. When the deformity relapses in spite of proper splinting a simple operation may be needed when the child is over two years of age. The operation consists in transferring the anterior tibial tendon to the third cuneiform. 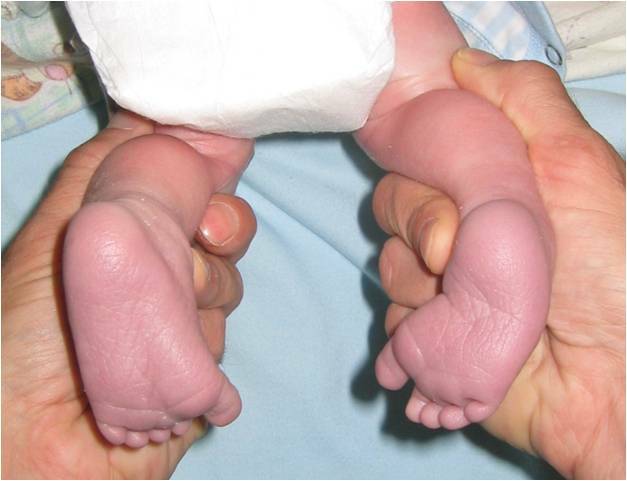 Poor results of cast and manipulative treatments of clubfeet in many clinics indicate that the attempts at correction have been inadequate because the techniques used are flawed. Without a thorough understanding of the anatomy and kinematics of the normal foot and of the deviation of the bones in the clubfoot, the deformity is difficult to correct. Poorly conducted manipulations and casting will further compound the clubfoot deformity rather than correct it making treatment difficult or impossible.